Over 40% of cannabis business owners are planning to take their companies into a new market within the next year, according to a Marijuana Business Daily survey. Of the business owners intending to expand, the vast majority have identified opportunities in both the medical and recreational markets. With sales continuing to grow rapidly in mature recreational cannabis industries like Colorado and Washington state – and promising new medical markets such as Maryland, Ohio and Pennsylvania set to come online in the near future – it’s perhaps not surprising that many entrepreneurs are looking to expand into both medical and adult-use markets. MJBizDaily’s anonymous online survey, conducted Aug. 9-13, includes responses from 389 marijuana business owners and founders. Over half of business owners in the ancillary products and services sectors who responded are looking to move their companies into new cannabis markets. These types of businesses provide necessary equipment and services to the industry but don’t actually handle the cannabis plant. Therefore, ancillary companies don’t run afoul of federal marijuana laws, which makes it relatively easy for them to expand across state lines. On average, owners of these ancillary companies are looking to grow into eight new markets within the next year. California and Florida were cited most frequently by ancillary business owners looking to expand on the medical side of the industry, while California and Nevada proved most popular among those planning to enter new recreational markets. In general, expanding into new markets is a more difficult proposition for plant-touching companies. Limits on the number of available licenses, a lack of access to capital and the logistical hurdles of operating a business in accordance with various state and local regulations all likely contribute to the relatively low percentage of business owners in the retail and wholesale cultivation segments of the industry who plan to take their companies into new markets. Factor in the long, steady price declines in the wholesale marijuana market, and it’s easy to see why cultivators are less likely to expand than any other segment of the cannabis industry. However, 50% of business owners in the infused product space – a plant-touching sector of the cannabis industry – intend to make a play in a new market within the next year. Infused product makers are able to leverage licensing agreements which allow their brands to be produced by other manufacturers that are physically located in the state where the products will be sold, giving these businesses more flexibility than plant-touching companies in other MJ sectors in terms of operating in multiple states. As a whole, the average plant-touching business owner with expansion plans intends to move into three new markets within the next year. California and Nevada were cited more than any other market for plant-touching business owners looking to expand their medical operations. And for those planning to grow into new rec markets, 35% are eyeing California – more than any other state by a wide margin. 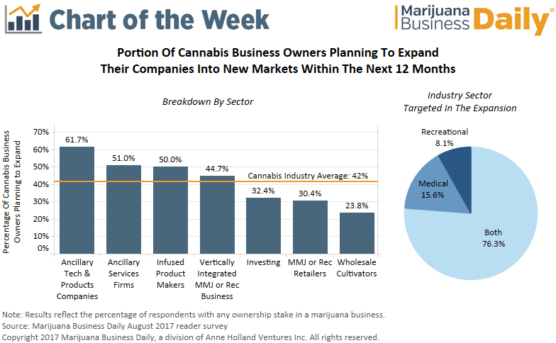 While it’s unlikely that all business owners with plans to expand into a new market within the next year will realize their goal, it’s clear that growth – particularly into California’s new medical and recreational industries – is top of mind for many cannabis company leaders.